Art Gallery Quilt Show - registration form went to members in email. Contact Debbie Grifka if you have questions. Sewing Retreat at Hankerd Inn - retreat is full, however if you want to attend, it is possible that you could stay in one of outer buildings. Contact Amanda if you have questions. Amy S. passed on the information that Amanda would like to give up the Retreat Chair position. Amy is willing to take it over since she ends up having to deal with payments, etc. anyway. Vintage and Antique Sewing Machine class - Kathy discovered this is actually a 2-day class so the board will need to work on whether we can do this with our current location (cost and availability). Kim noted that if we did it Sept 30 and Oct 1 that would be one day in each month. Current plans are for March. See November minutes for the responses to questions raised at the last meeting. Next Sew-In will be January 7. Kathy will send registration email out. Karen held a drawing to reward those who participated in some way to our charity quilt offerings. The winner was Kim U. (gift card to Pink Castle). Reminder that after the January meeting, Maggie will take over as Charity chair. In 2016 we donated 9 quilts to the PULSE (Florida) effort, 6 to Mott's and 4 to the VA.
Our MQG dues have been paid for 2017. We came in right at the cut off before the higher rate. The rest of the meeting included sharing our favorite "make" (did not need to be quilt related), show and share, our Yankee ornament swap, and holiday party. Reminder that our January meeting will be elections and bylaw review. For those who are on FB, respondents to the "Bylaw Bingo" questions will be entered into a drawing. If anyone wishes to run for an office, be on a committee or chair a committee, let any of the board members know. This is the last meeting at Cavalry. Future meetings will be held at the Nonprofit Enterprise at Work (NEW) Center @ 1100 N. Main St. Ann Arbor. Reminder that membership dues are past due for 2017. MQG decision: the Board has decided to remain in MQG for 2017. We will revisit the decision in April following a letter that is being sent to National outlining our concerns. Amy D. will also be attending the leadership breakfast at QuiltCon and she will see if there are positive changes in the works. We had 2 sew-ins at the NEW center. One was in the larger room and one in the smaller. Both worked well although obviously we can't have as many participants in the smaller room (10-12 in larger, 7 max in smaller). Art Gallery Quilt Show - Debbie Grifka has been planning for the Quilt Show in March (entire month). She will be sending out guidelines and more information shortly. There will be a $10 per quilt administration fee. She noted that the Gallery does publicity and holds a reception on the first Friday of the month. We also can hold our own reception and/or publicity. 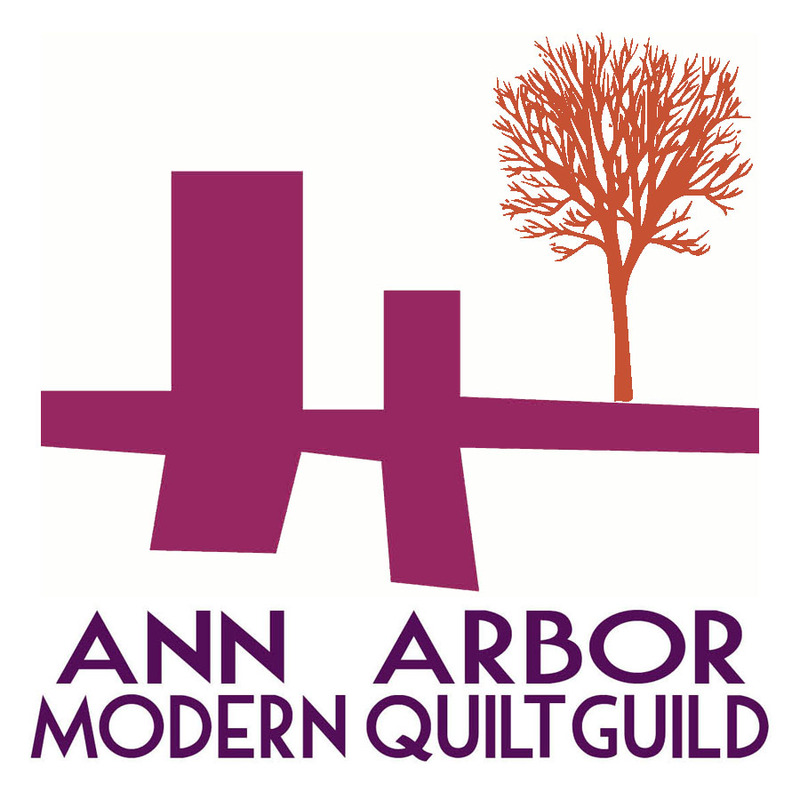 Deadline for quilts is January 11 - they do not need to be ones you've made new for this event. Also, she reminded members that you can offer your quilts for sale if desired and the gallery gets a 15% commission. December meeting is our holiday party. If you like, you may bring cookies or a savory to share. The Board will also be providing some fruit/veggie-type offering. Also, please bring your FAVORITE MAKE to show. We plan on gathering in a circle and just showing off the item and saying our name to help us get to know each other better. Your item does not need to be a quilt. Sewing Retreat at Hankerd Inn - we have the minimum attendees (currently 15). Cost is $145 for Friday through Sunday, $180 if you also want to come early on Thursday (currently only 1 or 2 have said they want to come early). If we have early arrivers, you can arrive anytime on Friday. Question was asked if someone could opt out of the meal plan (and pay less) - Amanda will check. Kathy presented a proposed one day retreat at NEW to learn how to maintain and restore vintage and antique machines. The vendor (Sew Purty) is out of Kentucky and he has offered to give us his lower price of $250 per person. It looks like we have enough interest to probably fill the class (maximum of 11 attendees). If we hold it at NEW we can probably do it in conjunction with the normal sew-in. NOTE: It looks like this is a 2-day class so we may need to get some more information or figure how to make that work with our Center space. How old is old > I think most people consider vintage as being pre-plastic, but lots of people consider the Singer 401, 403, 501 "vintage" and they have a plastic gear in them. Some consider the machines from the 70's vintage and they are loaded with plastic. Personally I don't care myself. Anything someone wants to clean and shine and try to get running is ok with me. Plastic cleans just like paint (usually without the danger of damaging it) and the bright parts polish just the same (most of the time easier). Can I bring my serger to repair > Sergers are fine as long as they keep one thing in mind; I service and repair the ones my wife and her cousin use but that pretty much sums up my experience with them. I've not worked on them extensively but I will be glad to tackle one. If someone does bring one though, I'd like it known that I can't leave the rest of the group waiting on me while I spend a great deal of time with one. If there is something that needs extensive time spent on it, I always am available to stay late on both days to deal with those kind of issues but after the others have left, so as not to take away from their time. I will do my best to help though should someone bring one and, as I said concerning the plastic sewing machines, they clean and polish just as well as a painted machine. My machine is in cabinet and I don't think it will come out or does he have instructions on how to get it out > Machines in cabinets are welcome, and if they need assistance removing the machine from the cabinet so they can bring the head only I will try to help out with that too. I would just need that person to contact me and I'll need to know if it is a wiring issue that is preventing them from removing it or just not sure how to get the machine loose. I may need a picture too, but whatever the issue I will talk them through getting it out. Charity quilts - reminder that next month we will have our drawing for members who have created or worked on charity quilts so be sure to put your name in the bowl. Lynn Harris class - is on Saturday, we have 16 members signed up. It will be from 10am-6pm. Kathy will send out a reminder email for supplies and the code for the building. 2017 Officers - reminder to let the board know if you are interested in running for office or filling a chair spot. Karen announced that she will not be doing Charity Chair. Maggie expressed interest. Currently the rest of the current board is planning on running again, but no one is adverse to having others run as well.